In this subsection of the section that deals with the analysis of the two aspects of no self, Jamgon Kongtrul Lodrö Thaye explained the commonalities of the no self of phenomena and the no self of a person. This subsection is divided into five parts. Are the two aspects of no self inseparable or are they distinct? The true nature of both aspects of no self is the same. The no self of phenomena means that things have no independent true existence, and the no self of a person means that individuals have no independent true existence. Both phenomena and persons have this in common, but when it comes to what they do not have in common, they are analyzed separately. Since there is a difference as to understanding and knowing what needs to be negated and eliminated or destroyed, the two aspects of no self are analysed distinctively. Why are two aspects of no self taught if persons and phenomena have the same nature? There are many different Buddhist disciples. Some disciples are less capable of understanding the profound teachings and many have differing aspirations, so one Dharma will not do justice to all of them. The Buddha presented the Hinayana teachings for students with less wisdom, diligence, and capacities; these persons are focused on attaining liberation from suffering for themselves. The Buddha did not say to people with little faith in the Dharma and with less capabilities, “This is what you must believe, understand, and practice. It will not be right if you don’t.” He gave them teachings on the no self of the individual and on removing the obscuration of the defilements, i.e., teachings that they were capable of appreciating and in which the definitive meaning of the Dharma was merely implied. This is how the Hinayana paths of the Shravakas and Pratyekabuddhas were established. The Buddha presented less obvious teachings that need to be interpreted as well as direct teachings that do not need to be interpreted. It would not have been right if the Buddha had withheld the explicit and definitive teachings from disciples aspiring to benefit all living beings without exceptions and throughout space and who were capable of appreciating and comprehending the teachings on the no self of phenomena. He gave the definitive Dharma teachings, just as they are, for the benefit of disciples who have a vast motivation and are capable of realizing the profound truth of perfect awakening. And that is how the path of the Mahayana tradition was established. If we look at what needs to be refuted in terms of the two aspects of no self, the self of the individual needs to be refuted first. Actually, the self of a person does not truly exist as an independent entity. It has no reality, yet, in terms of delusory cognition, it appears as if there is a self of an individual, i.e., although there is no self of a person, it seems there is. So, even though a person has no reality, we need to go through the process of refuting what we believe to be the own self. Also, although things have no reality but we imagine that they do, our belief in the independent existence of phenomena needs to be refuted. Despite the fact that persons and things have no true nature and thus have no inherent real existence, we perceive and apperceive them as though they do. If persons and things were true independent existents, it would be impossible for them to become non-existent at some point and vice versa. If persons and things did not exist, they could not become existents. But, to eradicate our mistaken belief in the true independent existence of the self of a person and the self of phenomena, we need to refute the inherent true existence of persons and things. In the fourth part of this subsection, Jamgon Kongtrul Lodrö Thaye tells us that to gain certainty of the no self of both a person and phenomena, we need to engage in the reasoning of pramana (the Sanskrit term for ‘valid cognition’). One way of gaining valid cognition of no self is by engaging in negative proof and the other way is by engaging in positive proof. The analytical reasoning of negative proof means refuting the self of things, whereas the analytical reasoning of positive proof means affirming the true nature of things. When refuting the true existence of an individual self, only negative proofs are employed. There are two kinds of positive proofs. They are: proof through result and proof through identity. The proof through result concerns something different than that which is being affirmed. It would be, for example, like seeing the smoke of a fire that is not visible on a high mountain pass. Both fire and smoke are different, but seeing smoke is positive proof that there is a fire. The proof through identity has to do with things that arise due to impermanence. If something is a permanent, independent true existent, it could not arise or could not be made. Since everything arises in dependence upon causes and conditions that need to be present, an object could not arise, would not be present, but would cease if and when its causes and conditions changed or became incomplete. These two kinds of positive proofs are used to refute a self. There are two kinds of negative proofs. They are: proof through an absence of a result and proof through contradictory phenomena. The proof through an absence of a result is, for example, arguing that because there is no smoke, there is no fire. The other negative proof is the presence of that which is contradictory, for example, since there is an ocean, there is no fire. In this verse, Jamgon Kongtrul Lodrö Thaye offered detailed logical inquiries that Madhyamika scholars carry out to examine the ultimate truth of phenomena. One of the methods is investigating whether phenomena are one or many. The reasoning is: If a phenomenon has independent existence, then it would be a single entity that is not comprised of parts. But phenomena consist of many parts, and not one of the many parts is a unique entity. It follows that the true nature of phenomena is neither one nor many. Another method is to investigate whether attributes of phenomena arise from four extremes. The reasonings are: (1) Attributes do not cease because they are not born; (2) they are not separate because they are not one; (3) they do not come because they do not go; and (4) they are not nothing because they are not lasting. The chapter on “The View” in “The Compendium of Knowledge” consists of seven sections. We have looked at the no self of phenomena, the no self of a person, and the no self of both in the section on the analysis of no self. In the subsection that we will look at now, Jamgon Kongtrul Lodrö Thaye wrote about the definitive analysis used in the Madhyamaka traditions to establish that phenomena have no independent true existence and that the true nature of all things is emptiness. There are two Madhyamaka traditions. They are the Rangtong and Shentong schools. “For the Svatrantika school, all things are established as not truly existent. The concept that clings to this (non-existence) is (also) given up (and the resulting) emptiness is asserted. The Buddha presented the teachings on the no self when he turned the Wheel of Dharma a second time. After he had passed into Parinirvana, the Hinayana tradition was established and practiced. In the 2 nd century C.E., Nagarjuna composed texts in which he explained Mahayana in great detail. He established the Mahayana teachings and founded the Madhyamaka school. His main text is “Mulamadhyaprajna” (‘The Wisdom of the Middle Way’); the other five texts that he wrote are branch texts of this main work. In the 3 rd century C.E., Nagarjuna’s disciple, Aryadeva, taught and propagated the Mahayana-Madhyamaka. In the course of time, subdivisons of this tradition were established. Nagarjuna and Aryadeva were Madhyamika-Rangtongs. In the 6 th century C.E., Buddhapalita composed a commentary to Nagarjuna’s main work. His explanations of the Mahayana-Madhyamaka view are known as the “Prasangika system of Madhyamaka.” Bhavaviveka criticised Buddhapalita and wrote that he had misinterpreted Nagarjuna. Through his works, Bhavaviveka founded the Svatrantika tradition. In the 7 th century, Chandrakirti wrote a commentary to Nagarjuna’s work in which he criticized Bhavaviveka and propagated the view of the Prasangikas. The Svatrantrikas, who are called “Masters of the East,” adhere to the interpretations of Bhavaviveka, Jnanagarbha, and Shantarakshita. The Prasangikas adhere to the interpretations of Buddhapalita and Chandrakirti. That is how the two traditions of the Rangtong school were founded and developed. In Tibetan culture, the Prasangika view is considered higher than the Svatrantika. It isn’t a matter of superiority, rather, of different approaches. We need to understand them both. The Svatrantikas see that the true nature of the five skandhas and all things is empty of inherent existence and teach that the true nature exists. But it is a contradiction to say that a non-existent is an existent. Therefore there is the division into the two truths, the relative truth and the ultimate truth. Since existence and non-existence are opposites, there are the teachings on the relative and ultimate truths. Relatively, things exist; ultimately, things do not exist. The Svatrantikas present their view in such texts as “Madhyamakalankara” and teach that things exist relatively and that ultimately things have no true existence. So, they teach that the relative truth of existents and the ultimate truth of emptiness are distinct. The Prasangikas do not see the two truths separately. They teach that while things appear, their nature is devoid of independent existence, i.e., their true nature is emptiness. The two truths are indivisible, i.e., while there are appearances, their true nature is the non-existence of independent reality. This means to say that appearances and emptiness coexist. Emptiness does not denote nothing, rather, it is that which makes it possible for things to appear and exist and is never separated from an appearance or experience. For example, if we see a tiger in our dream, it appears to exist but does not truly exist. Prasangikas teach that there is no need to separate the two truths, since the truth about relative realities and the truth about ultimate non-existence are truths about one and the same object that is being investigated, no matter which object it is. “The particular and uncommon Yogachara (Madhyamaka) system (is to) realize that there is nothing other than mind, that even (this) mind does not exist, (and that) both (perceived and perceiver) do not exist. (One then rests in) the Dharmadhatu, which is (described through) seven vajra points. “(The tathagatagarbha is) the heart essence of all sentient beings and (fully manifest in) Buddhas. (It is) not similar to the self of the individual, (because it is) free of mental elaboration. (In its essential nature) samsara and nirvana are inseparable; it is free of a mere lack of self (in the individual). (Free of being) with and without appearance, (it is the ultimate that) even transcends dependent arising. Buddhism declined in India three times. When one decline happened, there were no drums or gongs in the monasteries, but sticks of wood were struck to make an announcement. There were seven different ways to beat what is called “ghandi” so that the monks knew which practice would be done at seven different times of the day. At the ancient Indian Nalanda Monastery, the ghandi was hit in a specific way to say, “May the non-Buddhists be defeated and the Buddha’s teachings spread.” A non-Buddhist man used to beg for food at Nalanda and heard this. He became angry and thought, “I cannot stand that these people are so nasty and malicious.” He and his companion decided to stop the people at Nalanda from announcing such things. One of their friends was staying underground, in complete darkness, while practicing to attain the power of the sun. One man was out begging for food to feed both of his friends. The beggar said to his practitioner friend, “I have been providing you with food for twelve years now. You must accomplish your practice by tomorrow or you are a dead man.” The practitioner was extremely fervent. The next day he recited a mantra on a handful of earth and threw it at Nalanda. As a result, the university burst into flames. The famous library also caught fire. Water miraculously appeared and extinguished the fire, but many sacred texts were spoiled and ruined. At that time, there was a nun called Tsalwai Tsultrim. 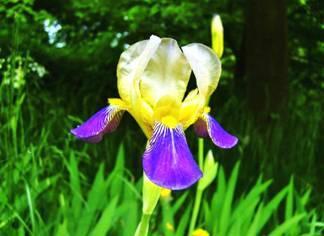 She suffered a great blow because of the fire and gave rise to the wish to restore Buddhism. She knew that she would not be able to do this and thought it would be best to have sons who would. With two different men, she conceived two sons, Asanga and Vasubhandu. In India, it has always been the custom for a son to follow in his father’s footsteps, so the boys asked their mother what profession each of their fathers had. She told them, “I didn’t bring you up for that reason. I want you to study Buddhism and revive it.” To accomplish this goal, Asanga meditated on Maitreya Buddha, and Vasubhandu travelled to Kashmir to study Abhidharma with Shankabhadra. Maitreya Buddha accepted Asanga as his disciple and took him to his pure realm called “Tushita.” Asanga stayed there for quite a while and received the instructions that he later compiled into books. These books are called “The Five Texts of Maitreya.” When Asanga returned to the world, he met his brother Vasubhandu and told him about the precious teachings he had received from Maitreya. Vasubhandu did not believe him but later repented and confessed. After he received the teachings from Asanga, the two sons of Tsalwai Tsultrim taught and spread the Buddhadharma. Thus they restored Buddhism in India. The fifth book of “The Five Texts,” which has the title “Uttartantrashastra,” became the transmission text for Shentong. What do Shentongs teach? That all phenomena are mind and that because nothing exists apart from the mind, no material or immaterial phenomenon has an own existence. Since objects have no true existence, the subject that apperceives them has no true existence either. In this way, Shentongs realize the true nature of things, which is emptiness, as well as the non-reality and non-duality of external phenomena and the internal mind. There are seven vajra subjects that are dealt with in the fifth book of “The Five Texts of Maitreya.” The seven vajra subjects of the “Uttaratantrashastra” are: (1) The Buddha nature, which is about the result; (2) the Dharma is the teachings; (3) due to the Dharma, there is the Sangha. (4) Due to the Sangha, there is realisation that all living beings have Buddha nature. (5) When purified of defilements that obscure the Buddha nature, there is enlightenment. (6) When enlightenment has been attained, all qualities of a Buddha become manifest, such as the ten powers, the four kinds of fearlessness, the 32 major and 80 secondary physical marks of a Buddha. (7) By having these qualities, a Buddha’s activities benefit living beings. The Shentongs teach that there is Buddha nature. It is replete with all qualities of a Buddha, while its nature is emptiness, i.e., devoid of true reality. At all times and even when it is not realized, the Buddha nature is present within all living beings and manifests when it is realized at Buddhahood. The Buddha nature is not what is referred to as “atman” (‘the self’) in other religious traditions, because followers of those religions think that the self is a truly existing entity. The Buddha nature is devoid of an own nature and therefore it is not an entity. Of the nine images that Asanga presented in the “Uttaratantrashastra” to exemplify the Buddha nature, two are: the body of a Buddha being enclosed within a lotus and the Buddha nature being like gold lying in a dump. As to the first, the Buddha cannot be seen when enclosed in a lotus. Once the petals are fully opened or removed, the Buddha can be seen. In the same way, the qualities of a Buddha are present within all living beings but are obscured by the defilements. These qualities become manifest when the defilements have been removed, and then a Buddha can be seen. There are three stages of manifestation. They are: the stage of impurity, the stage of partial purification, and the stage of complete purification. The stage of impurity is that of ordinary living beings; at this stage all qualities of a Buddha are concealed by the defilements. The stage of partial purification is that of Bodhisattvas; at this stage many defilements have been removed through practice. The stage of complete purification is the state of Buddhahood; at this stage all obscurations have been completely removed. Another example of the presence of the Buddha nature in ordinary beings is a lump of gold lying in a dump. The gold that cannot be seen when it is covered with rubbish remains the same for hundreds of thousands of years. Let us take the image of a poor man who built his cottage above lots of gold and, not aware of it, suffers very much due to having to work very hard to make ends meet. If someone who is clairvoyant tells him that he only needs to dig up the ground beneath the floor of his cottage to become rich and the poor man does this, he will become free from the suffering of poverty and of having to work hard for his living. In the same way, the Buddha nature has been within us for hundreds of thousands of lifetimes. It is not the fault of the Buddha nature that we have not been aware of it and have not realized it. As long as it is covered and obscured by our defilements, we will not benefit but will continue experiencing hardships and sufferings. The Buddha saw this and therefore taught, “You have the Buddha nature within yourself, but you have to remove the defilements by practicing diligently. By removing the defilements and thus manifesting the Buddha nature, you will become free from hardships and sufferings and will have all the qualities of a Buddha.” This is the teaching of the Shentong school as taught by Maitreya Buddha through Asanga and Vasubhandu. Jamgon Kongtrul Lodrö Thaye tells us that the Shentongs present the definite teaching on the Buddha nature but that it is very difficult for ordinary beings, Shravakas, Pratyekabuddhas, and beginners on the Bodhisattva path to understand and realize. It is necessary to study the teachings of the Shentong tradition in order to realize the Buddha nature. We have looked at four of the five subsections of the analysis of no self. The fifth subsection deals with what has become known as “the two chariots.” They are called “the profound view tradition” of Nagarjuna and “the vast conduct tradition” of Asanga. We can look at them and think Nagarjuna’s view is correct and Asanga’s view is incorrect or vice versa, but that is not the correct way of regarding them. We need to learn that the views of both traditions are without error. Having studied and contemplated the profound view that Nagarjuna presented, we also need to practice it. Having studied and contemplated the vast tradition of Asanga, we also need to practice it. In fact, each chariot clarifies the other, and that is why we regard both of them as equally invaluable. There are people who argue that Nagarjuna’s teachings are better than Asanga’s teachings or vice versa. There are also people who claim that Shentong is higher than Rangtong or vice versa. Arguing in such ways is not correct. People who argue like this have not had the good fortune to learn and contemplate the Dharma teachings properly, and due to not having the right understanding, they will not be able to learn the Dharma well or progress in their practice. Jamgon Kongtrul Lodrö Thaye wrote that we should study and clearly understand the sacred texts of both Nagarjuna and Asanga. We should not think that their teachings are alike and that we only need to study the one and not the other. We should understand both views, just as they are. Nagarjuna ’s teachings primarily deal with emptiness. Asanga’s teachings primarily deal with clarity and the Buddha nature. In the text entitled “Letters of Advice to a Friend,” Nagarjuna presented teachings on the First Turning of the Wheel of Dharma by the Buddha; in texts dealing with logical reasoning and the middle way, he presented teachings on the Second Turning of the Wheel of Dharma by the Buddha, and in praises that he composed, he addressed the Third Turning of the Wheel of Dharma by the Buddha. Asanga wrote “The Five Texts of Maitreya” as well as compilations on the Buddhist vehicles. Vasubhandu composed eight works. Madhyamaka is explained perfectly in all these sacred texts. If we contemplate and appreciate them correctly, we will be able to open our eyes of wisdom, we will have a pure view of the Buddhadharma, and we will be able to explain the teachings to others. So, there are the two traditions, that of Nagarjuna and that of Asanga, and there are many aspects of the teachings. Sometimes there are provisional teachings on the relative level, and sometimes there are definitive teachings on the ultimate level. Sometimes the teachings deal with what is obvious and sometimes with what is very subtle. Some teachings deal with cutting through conceptualisations, and others are explanations on meditation practices. If we are able to understand both traditions of the two chariots, we will be able to understand the Sutras and Tantras. We will not think, “Oh, the Sutras are right and the Tantras are wrong” or the other way around, “The Tantras are right and the Sutras are wrong.” We will not make such mistakes if we understand the two chariots correctly and we will then be free of imputations that are made by an ordinary mind. We need to understand the Buddha’s view and not impose our ideas upon the Buddhadharma. Therefore we need to understand Rangtong and Shentong. If we do not understand the Svatrantika and Prasangika traditions of Rangtong, we will continue being attached to things as if they truly exist. By understanding the no self of a person and phenomena, we appreciate the ultimate truth as explained by the Shentongs, i.e., there is clarity, wisdom, and Buddha nature. Both the Rangtong and Shentong schools clarify the Buddhadharma. Since there is no contradiction, understanding the view of the Shentongs enables us to better understand the view of the Rangtongs, and understanding the view of the Rangtongs enhances our understanding and appreciation of the Shentong view. 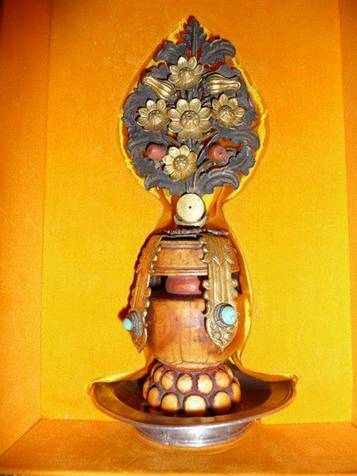 The photo shows "the precious Long-life Flask or Bumpa (tshe bum) of the 1st Jamgon Kongtrul Lodro Thaye. It was passed down to the previous Kalu Rinpoche and is now in the possession of the present Kalu Yangsi Rinpoche." - On July 7, 2012, Thomas Roth from Stuttgart posted the invaluable photo on the FB of the late Ven. Tenga Rinpoche & offered the explanation in the caption that is quoted here. The translation of the teachings that Khenchen Thrangu Rinpoche presented in Tibetan were simultaneously translated into English by Peter Roberts. The Root Text, “Gaining Certainty about the View,” was translated under the guidance of Khenpo Tsultrim Gyamtso Rinpoche by members of the Marpa Translation Committee and was published in Kathmandu, Nepal, by Modern Printing Press Ltd., in 1994. The teachings of this seminary were transcribed & edited from the recordings by Gaby Hollmann in 1996 and in 2013 the manuscript was typed again & revised for the Dharma Download Project of Karma Lekshey Ling Shedra, Nepal. This rendering is for personal studies only; it may not be published anywhere else, and it may not be translated into another language without prior permission from everyone mentioned here. Copyright. – May virtue increase!